Unfold 1 pastry sheet on a lightly floured surface. Roll the pastry sheet into a 12-inch square. Place the pastry sheet onto a baking sheet. Brush the edges with water. Fold over the edges 1/2 inch on all sides, pressing firmly to form a rim. Prick the center of the pastry thoroughly with a fork. Repeat with the remaining pastry sheet. Bake for 15 minutes, rotating the baking sheets between the top and bottom oven racks halfway through the baking time. Divide the pecans, coconut and chocolate between the pastry crusts. Drizzle half the condensed milk over each. Bake for 15 minutes or until the pastries are golden brown, rotating the baking sheets between the top and bottom oven racks halfway through the baking time. Let the pastries cool on the baking sheets on wire racks for 30 minutes. 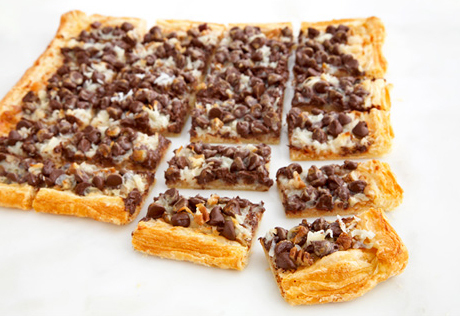 Cut each pastry into 24 bars. Easy Substitution: You may substitute white chocolate pieces for some of the semi-sweet chocolate pieces.